I’ve been in restaurants that serve you so much food you’ve got enough leftovers for a week. And I’ve been in ones that serve such little portions you wonder if you ordered an appetizer by mistake. While these examples may be extremes, sometimes figuring out the best/healthiest portion size can be tricky. Smaller is generally better for us, although not always satisfying! And what if you do know the best portion size for you, but you’re not sure how to translate that information when it comes to actually putting the food on your plate. For instance, you want a cup of one thing, three ounces of something else and darn, you left those handy measuring devices at home in your kitchen. I got some advice from Maine SNAP-Ed. The program is funded by the U.S. Department of Agriculture (USDA) Food and Nutrition Service, which is administered by the Maine Department of Health and Human Services (DHHS) and implemented through a contract with the University of New England (UNE). SNAP-Ed provides education about healthy eating to people who have to work within a limited budget. It can be a challenge to make the right choices when the food that seems like it would be the best for us is sometimes the most expensive. It can be done. There are forty nutrition educators and program coordinators in Maine who do presentations in schools, grocery stores, food pantries — wherever they see a need. They also offer a series of hands-on cooking classes. While their primary audience is low-income Mainers, the information on their website is useful and accessible to all of us. The first thing to understand about portion size, the educators say, is that it isn’t the same thing as serving size. Portion size is the amount of food you decide to eat. Serving size is what the manufacturer of a product lists on the food nutrition label. It’s merely a suggestion. Put foods on a plate rather than eating directly out of the box or bag. This allows you to see how much you are eating. Try eating off smaller plates and drinking out of smaller cups. If you cut your serving in half you get two meals for the price of one! Store properly and use the leftovers for lunch or dinner the next day. And as a general rule of thumb … A little less is usually plenty. An ounce of cheese is about the size of your thumb. Three ounces of meat is about the size of your palm. A cup of fresh fruits or veggies is about the size of your fist. One-half cup of cooked veggies is about the size of a lightbulb. One-half cup of dried fruit is about the size of a tennis ball. Heat a medium saucepan or skillet over medium-low heat. Add mustard, honey, and vinegar and mix well. Cook until sauce boils and becomes thick, about 10 minutes. Add green beans and stir to coat evenly. Cook until beans are heated through. 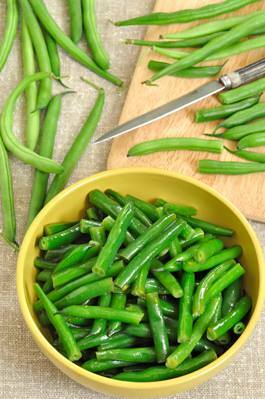 Four cups of green beans is about 1 1/2 pounds fresh, 16 ounces frozen, or two 16-ounce cans (drained). Honey is not recommended for children under the age of one. 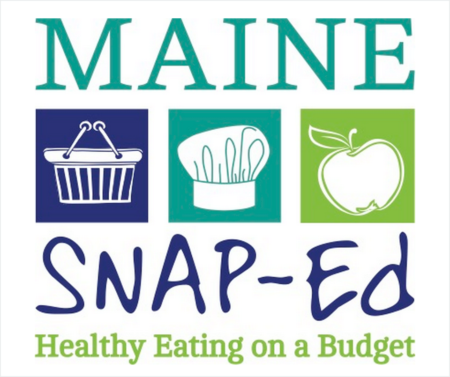 I talked with Elizabeth Pratt, who manages Maine SNAP-Ed, and we decided to do some collaborating so that I can share their nutrition expertise with all of you. I plan to attend some of their cooking classes and demonstrations and in addition to writing blog posts will shoot some short videos. If you’ve got some specific questions about how to prepare healthy meals when you’re low on time, energy, and/or money, send me an email or write a comment.